The United Nations is bringing together world leaders on Tuesday to focus on the challenge of climate change. 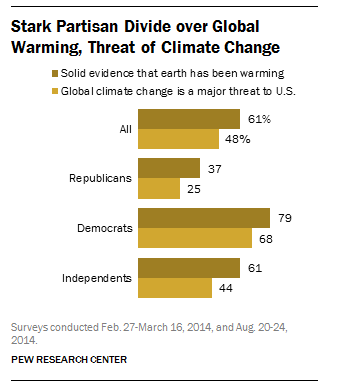 In the U.S., a solid majority believe there is evidence that global warming is happening, but they do not rank global climate change as one of the top threats facing the country. Last month, nearly half of Americans (48%) rated global climate change as a major threat — well behind concerns such as the militant group ISIS (67%), Iran’s nuclear program (59%) and North Korea’s nuclear program (57%). In an international survey of 39 publics last year, Americans were among the least concerned about climate change threatening their country. Global warming also ranked near the bottom of Americans’ 2014 priorities for President Obama and Congress (28% said it was a top priority). Similarly, when asked last November about long-range foreign policy goals, 37% named global climate change as a top long-range goal; by comparison, 83% cited guarding against terrorist attacks and 81% named protecting American jobs as top goals. Although action against climate change is not a high priority, most Americans continue to believe that such warming is occurring. In Pew Research’s 2014 Political Typology survey, about six-in-ten Americans (61%) said there is solid evidence that Earth’s average temperature has been getting warmer over the past few decades, compared with 35% who disagreed. And most who believe the Earth is warming said it is primarily due to human activity (40% total), while 18% of the public said there is warming mostly because of natural environmental patterns. Views about climate change and the environment are at the center of one of the U.S.’s sharpest ideological divides, as seen through the different opinions of the seven Typology groups in today’s political landscape. About nine-in-ten Solid Liberals (91%) said the Earth is getting warmer, but just two-in-ten Steadfast Conservatives (21%) agreed. And there is a similar gap between those who said the U.S. should do whatever it takes to protect the environment and those who thought the country had gone too far in its efforts to protect the environment. Nearly all Solid Liberals (96%) and just 21% of Steadfast Conservatives said the U.S. should do whatever it takes, while 2% of Solid Liberals and 75% of Steadfast Conservatives say the country has gone too far.